Finally - A Portable Fan That Really Works! Great for Work, Gardening, Stadiums, Relaxing, Vacations, Hot Flashes, Hiking, etc. Beat the heat with this small, lightweight portable fan. It is battery operated and fully adjustable so you can get a cool breeze directed towards your neck and face at any time or place. When you're sweating, who needs the chill of air conditioning, when a bit of air circulation will make you cool and comfortable? Use a KooltroniK Portable Neck Fan. This unique portable neck fan was invented and designed in exacting detail by an Electrical Engineer who realized a need for it and has constantly been using it himself for years now. Too often we find ourselves working in hot buildings with little air circulation. I personally hate to perspire a lot, so I just slip on this portable fan and I can tolerate the heat much better. The fan blows air into a rear compression chamber which then deflects an adjustable breeze up to the neck and face and helps the heat raise off the top portion of the body (called the chimney-effect principle), thus cooling your whole body. 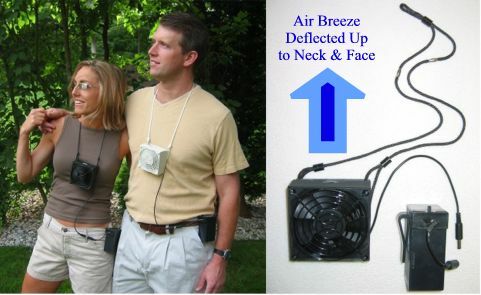 The portable neck fan is great for gardening in the yard or just relaxing outdoors on warm and humid days and nights. It is also great for spectators at ballgames, and for hiking, vacations, hot flashes, and many other purposes. The high quality construction of this fan is designed to last for many years of enjoyment. This is not a cheap toy. The rechargeable sealed gel battery has no "memory effect" problems and can be recharged in as little as three hours, or overnight by plugging it into the included charging unit. It will then be ready for the next day’s use, where it can provide a refreshing breeze for over eight hours at slow speed, over four hours at fast speed, or any combination of use therein. The battery can be clipped onto your belt, pocket, or any strap for portable convenience, similar to a cell phone’s clip. This high quality portable fan is quite small (3 5/8” square) and light weight (6 ounces) and has been specifically chosen for its low noise and long life. The wearer can adjust the cooling effect using three separate methods, making almost any temperature tolerable. Primarily, when you feel sufficiently cooled down, you can switch the fan to a lower speed just to maintain your coolness. You can easily adjust the neck cord’s length to move the fan closer to or further away from your face. Thirdly, you can adjust the angle of the fan to direct the breeze out away from the neck and face while still maintaining a lesser cooling effect. There are several safety features built into this portable neck fan. First, there are dual finger guards surrounding the seven blades. The rechargeable battery has an auto-resetting short circuit protection unit. The neck cord also has two links that can open if the cord or fan is ever pulled too hard, and can easily be reconnected later. Obviously, quality, safety, and convenience were my main concerns when designing this product. Four hundred of these portable neck fans have been assembled to test market the public’s reaction to the concept of a portable cooling unit that can go where air conditioners cannot go. I am quite confident that there are many other people out there like myself who would appreciate such a body cooling device. I definitely love it and I am sure you will, too!